Hybride (F) Your browser does not support any audio element. ibrido (I) Your browser does not support any audio element. hybrid (GB) Your browser does not support any audio element. When you get the phylloxera recognized as the cause of the vineyard dying, was from the 1880s, trying to grow through large-scale cross-breeding programs resistant to rainy grape varieties with good wine quality. However, the more Vitis vinifera shares these hybrid varieties possessed, the better was the quality of the wine, however, all of these hybrids with crosses of Vitis vinifera did not show sufficient vyllogen resistance. On the other hand, the mating hybrid varieties with little or no Vitis vinifera content were often inedible (foxtone) and unusable for winemaking. But early breeding goals were already resistance against the harmful fungi also imported with the phylloxera from America genuine and false mildew and more Vine enemies, as well as resistance to frost and drought and other quality improvements. In the breeding of the first and second hybrids generation were mainly the French breeders François Baco (1865-1947), Albert Seibel (1844-1936), Eugene Kuhlmann (1858-1932), Jean François Ravat (+1940), Bertille Seyve (1864-1939), Jean-Louis Vidal (1880-1976) and Victor Villard active. The French hybrids were used as partners for further hybridizations. US viticulture pioneer Philip wagner (1904-1996) led from the 1940s on his winery in Maryland Many came to America and was largely responsible that they spread to the entire east coast. Also from Wisconsin originating vine grower Elmer Swenson (1913-2004) used French hybrids for his frost hardy new varieties, Only relatively slowly, also pure Vitis vinifera varieties prevailed, a related pioneer on his winery in the Finger Lakes was the one at the Cornell University in the US state new York active Dr. Konstantin Frank (1897-1985). In the new breeding of mushroom-proof multi-hybrids many of these varieties (especially of Seibel and Seyve Villard ) still today as starting material for the crossing breeding. From when these intersections are no longer considered interspecific, because the species-external gene content is "low", is an important point regarding the approval of wines with indication of origin. The fight against the phylloxera However, after countless attempts, it was not won by crossbreeding, but by finishing that is grafting European scions on midsummer American documents, Since the phylloxera was slow to penetrate, did not rage everywhere and some hybrid varieties supplied at least drinkable wines, many winemakers ignored the early campaigns for refining in the first third of the 20th century understandably for cost reasons. Since the high-quality noble varieties of the European grapevine Vitis vinifera could survive only as more expensive Pfropfreben, strict laws against the hybrids were issued in this time in Germany and Austria-Hungary. According to the current state of knowledge, the discussions were conducted very emotionally and, from today's perspective, with absurd arguments. In 1929 published book "Die Direktträger" by Dr. med. Fritz Zweigelt (1888-1964) states that the specific toxic effects are hallucinations, zores in males, hysteria in females, mental and physical degeneration in children. People who regularly drink Noah wine get a pale, pale complexion, tremble all over and languish. Peasants with refined vineyards, on the other hand, are healthy, hardworking and have many children. In France, the direct carriers contribute to filling the madhouse. Thus, the winegrowers were put under pressure, their American vines to clear and instead to plant grafted vines. In many vineyards, however, these easy-care, high-yielding varieties outlasted because they were fungus-proof and resistant to rain. Often they were considered table grapes, also for wine jelly, Jam and vinegar used, but partly also pressed wines from it. Many winegrowers therefore refused for a long time to clear their American vines, so a gradual ban was enforced. In Burgenland in Austria, for example, this applied to the grape variety in 1926 Noah, In 1929, such wines or the blend with them were banned and decided in 1936 a general ban on planting. Only the generation of Piquette for own use was allowed. Only in 1991 was a decriminalization. According to EU Regulation is the new planting prohibited, for existing vineyards, there are still periods of use. Examples are the wines Americano (Switzerland), Fragola (Italy) and Uhudler (Austria) with three of the approved varieties in the picture. According to the EU regulation, no varieties of interspecific crossbreeds are allowed to carry wines provenance be generated. On the other hand, each member state can decide for itself which varieties it would like to use for it, or which ones it should, subject to restrictions Quality wine-grape varieties sets. Strictly speaking, all crossings with American or Asian vines would be excluded. However, this has brought some problems in recent years new varieties with himself, because under the term PIWI (fungi-resistant) should be as important breeding goal as high as possible resistance against mushrooms as Botrytis and both mildews, other pests or environmental conditions like frost be achieved. However, this requires Asian / American species, as many of the Vitis vinifera varieties are generally insufficient resistance have. Because of the grape variety regent There was a dispute between Germany and the EU in this regard. It was about the question of whether the variety should be regarded as a hybrid or not. It has a high proportion of the. Due to their American Vitis labrusca genes with 200 to 300 mg / l anthocyanin Malvidine-3,5-Diglucoside. Although this substance, often referred to as "hybrid dye", does not affect either health or taste, it does prove that it contains American genes and is recommended by the FDA INAO to a maximum of 15 mg / l content in a quality wine. However, the term "hybrid dye" or "direct carrier dye" is misleading because even non-crossed and / or refined Labrusca vines have the dye. The prohibition of interspecific crossings for wines with indication of ancestry (Quality wines, land wines) was justified by the EU mainly always with a lack of wine quality. In order to provide an objective basis for decision-making, a study was commissioned by the European Commission in 2003 by external contractors from Germany, France and Hungary. The research and scientific data were collected at the INRA as in Geisenheim levied. The study should provide answers to the following three questions: 1) Are there quality differences between wines from Vitis vinifera varieties and wines from interspecific varieties? 2) Is it possible to reduce the use of pesticides in viticulture by using interspecific grape varieties? 3) What economic effects would the use of interspecific grape varieties have? For the study, 18 interspecific grape varieties or vinified wines were included. The sorts Baco Blanc. Baco Noir. Bianca. Chardonel. Couderc Noir. Medina (1), Seyval blanc. Traminette. Vidal Blanc. Villard Blanc. Villard Noir and Zala Gyöngye were divided into the three groups "Old interspecific varieties", "Central European interspecific varieties" and "New mildew resistant interspecific varieties developed outside the EU". The four German new breeds Johanniter. Merzling. 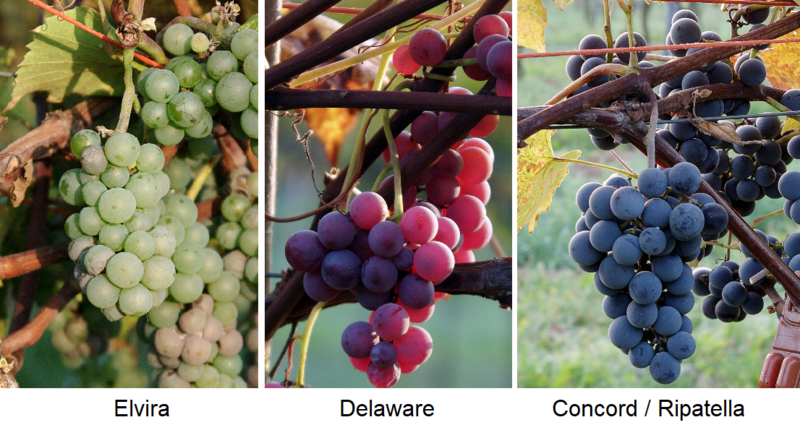 regent and rondo also contain to a small extent alien American and Asian genes, but were summarized as a fourth group as reference varieties with "fungus tolerant Vitis vinifera varieties". This is justified by backcrossing of the initial results with the Vitis vinifera varieties involved. The variety Regent was mentioned as "not considered as interspecific" and considered to belong to the species Vitis vinifera, although it also has non-native genes. With regard to the quality of the wines, the study showed that both poor and good quality can be achieved, provided that the interspecific grape varieties are cultivated according to their cropping practices and grown on adequate land. The assessment of the environmental impact has been very positive. The usage of pesticides would be significantly reduced in the use of interspecific varieties. A particular suitability will be particularly in the Organic viticulture authority. Looking at the impact on market equilibrium, the study estimates that increased use of interspecific varieties over the next ten years would increase total output by around 1.8% in the EU, thus neglecting the economic impact. This page was last modified at 19 February 2019 at 07:43.